Farrar, Straus and Giroux (BYR), 9780374347253, 32pp. 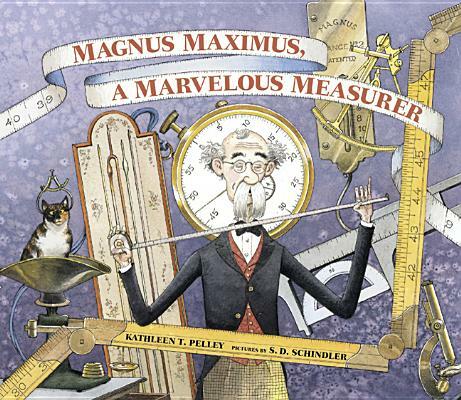 Magnus Maximus is a marvelous measurer. He measures wetness and dryness, nearness and farness, and everything in between. When a lion escapes from a traveling circus, Magnus and his trusty measuring tape come to the rescue. Now a hero, all is well until the day Magnus accidentally breaks his glasses, and he sees—for the first time—that he's been missing out on life's simple pleasures. Kathleen T. Pelley's marvelous tale and S. D. Schindler's inspired illustrations remind us that the best things in life are not meant to be measured, but treasured. KATHLEEN T. PELLEY was born and raised in Scotland and now lives in Greenwood Village, Colorado. She is the author of Inventor McGregor, illustrated by Michael Chesworth, and Magnus Maximus, A Marvelous Measurer, illustrated by S.D. Schindler. S. D. Schindler has illustrated many picture books. He lives in Philadelphia.